In Lighthearted Turn / Newspaper Takes Crime Reports / And Makes Them Haiku : The Two-Way Charlie Smith, publisher of The Enterprise-Tocsin, wanted to liven up one of the weekly newspaper's most popular items. So he started counting syllables — then put the finished poems on Twitter. A shot of the crime haiku, smack in the middle of the popular "Cops and Robbers" section of The Enterprise-Tocsin. It's no secret that NPR has a soft spot for haiku. Springtime, social media, the Super Bowl, even, um, grindcore? If it's a story worth covering, it's entirely possible we've squeezed it into 17 syllables. It turns out we're not the only ones who are sweet on the ol' 5-7-5. 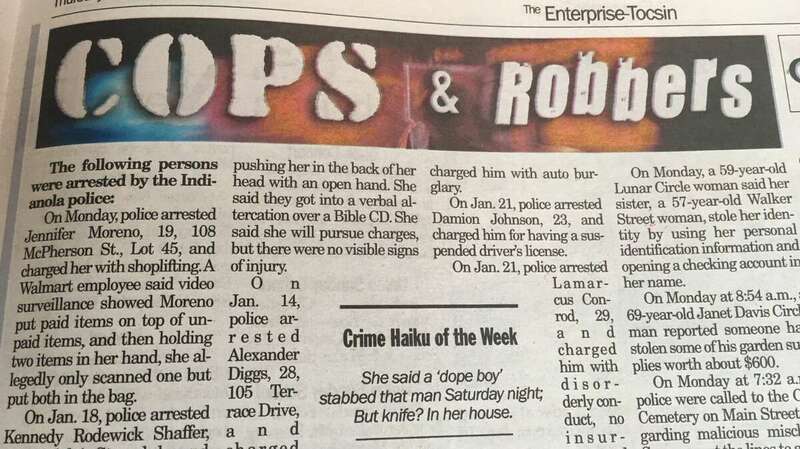 The Enterprise-Tocsin, a weekly newspaper based in Indianola, Miss., has been turning some of its police reports into haiku. And this week, the paper started publishing the curious little jewels on Twitter. "In an effort to reach the new era of digital-savvy, poetry-loving millennials, we have begun publishing a 'Crime Haiku of the Week,' " the newspaper tweeted Wednesday. And so began the stream of syllable-sensitive tweets. wave a BB gun at you. Charlie Smith, the 31-year-old publisher and editor of The Enterprise-Tocsin, tells NPR he started the haiku last month, as a way to liven up the newspaper's most popular section. "Cops and Robbers," a long-running summary of crime reports in the area, is often the part of the paper readers flip to first — but it usually ends up being just a big gray block of text. Smith figured a haiku would be an amusing way to break it up. So every Wednesday, on deadline, Smith decided to take one of those reports and sum it up in haiku. Smith says he received no feedback from the paper's readers at first. He was thinking about giving it up, but he got support from one important fan. "My mom told me she loved it," Smith says. "I couldn't let her down." He says it was only when he put the haiku on Twitter this week, rounding up all the poems he's written so far, that the audience at large took notice. Some faithful readers have even submitted haiku of their own. "I think it's finally found the right medium," he says.